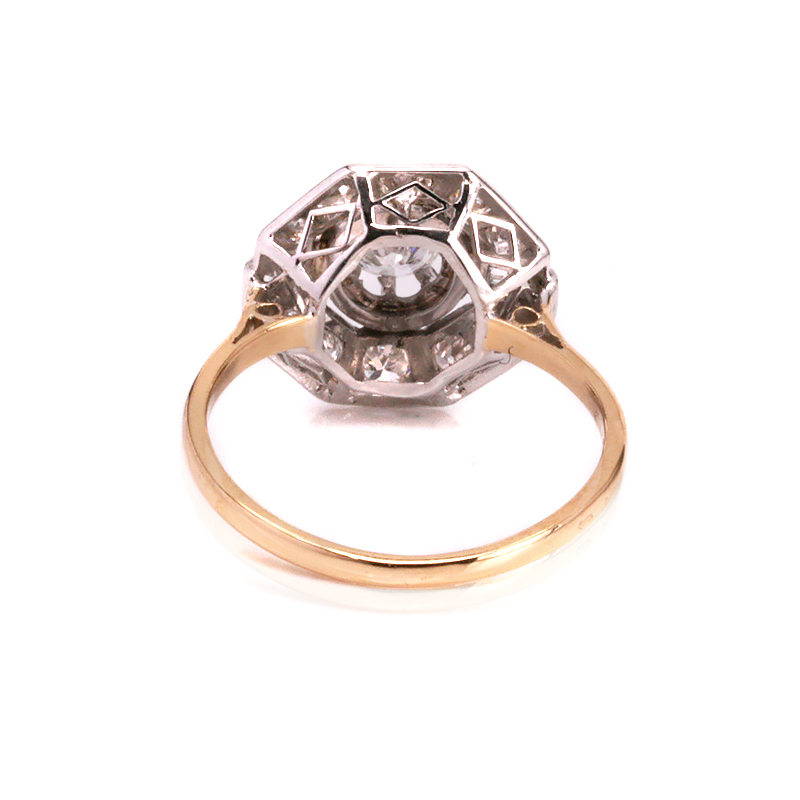 Product code: ES8087 Categories: Sold Items, Sold Jewellery, Sold Rings. What a fabulous style in this geometric designed Art Deco diamond ring dating from the 1930’s that would suit any finger and occasion including making a wonderful Art Deco engagement ring to always be loved and cherished. Hand made in France in 18 carat yellow gold and platinum, in the centre is a lovely round diamond that measures 0.38 carats and is set into the most amazing setting that somewhat elevates it in such an amazing way. And then there are five more diamonds set on the top and bottom of the ring that graduate ever so slightly in size and total 0.48 carats. And finally in such an amazing way, there are two square cut diamonds set on each side that add a further 0.08 carats to the ring. All the diamonds sparkle amazingly and are F to G in colour as well as VS in clarity. Measuring 14.4mm across by 13.mm, this ring is spectacular and will no doubt always be admired every time that it is seen. 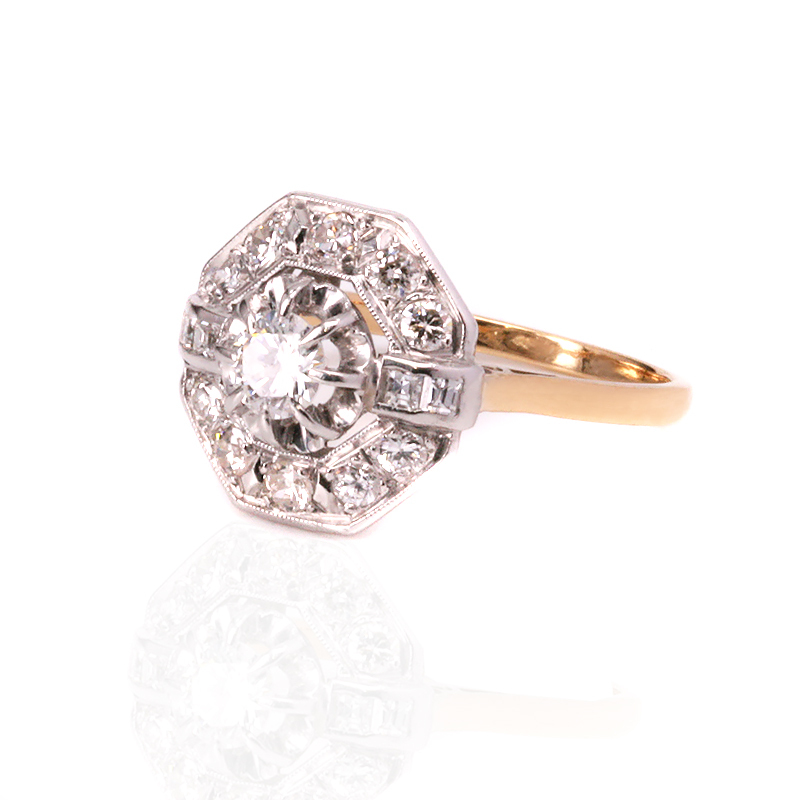 Hand made in 18 carat yellow gold and platinum, this Art Deco diamond ring is set with a combination of diamond cuts. From the centre round diamond to the square diamonds on the side, this ring sits perfectly on the finger.